The Finnish Saint of the Grasshopper. Is it true? If so, why and how did this holiday get started? Once upon a time, many many years ago in Finland they say (they being the geologists and such) there used to be wild grapes growing all over. How do they know this? From studying the remains of bears found in that area. Well, one season a bunch of grasshoppers (i.e. locust) with a voracious appetite for grapes happen to hop on into Finland. What to do? The Finnish grape framers (viners?) were very protective of their fields because they didn't have much of a growing season. (Note: It isn't exactly like the Italian or French vineyards up there.) So, rumor has it that they injected Vodka into their grapes to give them a bigger alcohol content. I guess this is an early version of "organic farming" regarding pest control? Feeling so happy and grateful to Urho, they declared him a saint. He did this on March 16, the day before St. Patrick's Day. Every year since then, the Finnish people celebrate St. Urho's Day on March 16. The official colors are purple to represent the grapes and green to represent the vines (or the dead grasshoppers -- depending on whose version you hear). The St. Urho's day ceremony begins at sunrise. Women and children go down to the lakeshore and chant "Heinasirkka, heinasirrkka, meine taatta hiiteen" just like St. Urho did thousands of years before or "Grasshopper, Grasshopper getta outta here" if you don't speak Finnish. (After all it's pretty easy to remember.) The men dress in green and gather at the top of the hill and then start a procession down to the lake kicking and waving pitchforks to scare off the imaginary grasshoppers. The celebration also includes singing, dancing polkas and drinking wine, grape juice for those underage and having Mojakkaa (fish soup pronounced like "moy-yah-kah") which is what St. Urho ate to give him his strength to fight grasshoppers. 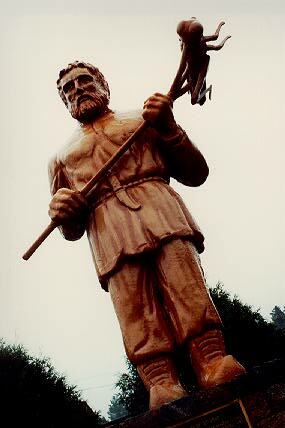 The city of Menahga, MN actually has a statue of St. Urho in it's town. (see photo above) The original statute was carved in 1982 with a chainsaw from 2,000 lb. oak block. Since then, it's been replaced with a fiberglass replica to deal with the harsh Minnesota weather. This one is 12 feet tall. There is also one in Finland, Minnesota. That statue is 18 feet tall, and looks more like a totem pole than a man. Every year, Rolla, N. Dakota holds a St. Urho's Day Parade! Let me begin by saying that I am not Finnish nor am I Irish. I am Italian. So I remain neutral on this St. Urho reality debate. I might also add, some of my very best friends are Finnish and Irish. I would also like to state that according to the "Holidays and Anniversaries of the World - Third Edition" by Beth A. Baker on Page 217 they list St. Urho's Day as a U.S. holiday started and sponsored by the Sauna Society of America, Washington, D.C. Growing up, I have always heard the Irish say that the Finnish made up St. Urho to get a day's start on the beer in town. They claim that there really is no such a person at all, but just an attempt to get at the "green beer" before the Irish do. :) Although some celebrations have purple beer. It all began around 1956, technically in another millennium. The verbal records say that it began at a St. Patrick's Day party in Virginia, Minnesota where the Irish were bragging about their St. Patrick and how he drove snakes out of Ireland. Getting sick of all this bragging, someone named Richard Mattson, who worked at a department store called Ketola's decided to blow St. Patrick's bravado off calendars by proclaiming that Finland had a wonderful saint who got rid of poisonous frogs. As the night went on, and the booze got drunk, they decided to try to come up with a name for this great saint. Hmmm? Saint Eero or Saint Jussi didn't have any ring. Suddenly Saint Urho seemed just right! Others claim that Dr. Sulo Havumaki, a psychology teacher at Bemidji College (Bemidji, MN) is the one who created the St. Urho who chanted and drove the huge swarm of grasshoppers into the sea. The Finnish version of a piped piper as others put it. Coincidentally, in 1956 the President of Finland was Urho Kekkonen. (Urho is a common name in Finland. ) Many believe that the name of St. Urho was taken from him, he even may have been the force who encouraged the spread and celebration of St. Urho's Day? Regardless of which version you choose to believe, most credit Richard L. Mattson, the manager of Ketola's Dept. Store as the originator of St. Urho's Day. Mr. Mattson died on June 5, 2001, shortly before his 88th birthday. He managed Ketola's Dept. Store for 42 years. And the grasshoppers, well they have "no comment." Sinikka, St. Urho's Wife, the real hero? Heinasirka, heinasirka, mena taalta heiteen! So all the praise has been going to the boys again! Urho getting all the glory, and Sinikka, lying unknown in dark ruins. But now, up from the grave, the spirit of Sinikka has risen! But he was married to the shy young maiden, Sinikka, the love of his life! Why Sinikka did all those things that Urho didn't have the time to! To save the vines and grapes in the land where all the Finns live. Sinikka was at home tending the vines where those grapes, big as figs, grew! To carefully pick off those vines those purple grapes, big as figs! And threw in the twelve children, bare naked, all in one lot! Wiped them down dry, and into the big grape barrel they did go! Sinikka told all the twelve children, from the little one to the big! And so much grape juice was ready by the end of the day. To store the juice 'til she could make it into jellies and jam! Sinikka was at home doing all the chores, which were not just a few! Sinikka ground up the grain for the loaves of rye bread she baked. So the family could eat with rye bread, pottuja and mojakka all winter! To buy the yard goods and shoe leather, as they cost money! And to trim the skirts and shirts nicely with braids and bows. And keep them in good condition for the whole family to use. and from the sheep's wool, Sinikka spun and knitted leggings for all of their legs! It's time to honor Sinikka, she stood by him through blood, sweat, and tears! And it was said by many that maybe Sinikka was the real sainted hero! Neffer peefor haff I hurd does words! Braaffest finn I effer seen! Unt ate culla moyakka effery hour. What crew as thick as chack bine needles. On this 16th of March, St. Urho's Tay! Brownielocks has made a few MORE St. Urho products for 2018! Besides fun cards, t-shirts, invitations, mugs, gift wrap, etc. We now have temporary St. Urho's Day tattoos! Wash them off on March 17th. Plus St. Urho finger nail wraps. And, bandanas too! 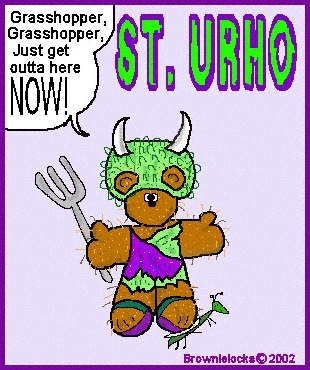 There's also St. Urho's fabric design if you want to make yourself a shirt or something. Just click "Newest" in the search area. Midi = "The Grasshopper Jig"